Painful callosities of the feet (PCOF) are a rare complaint in children with severe impairment of mobility and quality of life. There is no medical treatment available.We investigated the usefulness of a recently developed combined transplant technique-the sandwich transplantation with dermal collagen-elastin template in this rare condition. A 14-year-old boy suffered from PCOF for several years without any improvement by topical therapy, dermabrasion, and oral retinoids. He was unable to walk normally and suffered from severe pain. We performed a complete deep excision of the hyperkeratotic plantar tissue in general anaesthesia in combination with sandwich transplantation in the same setting. Dry sheets of collagen-elastin matrix (1 mm thickness) were placed on the soft tissue defects and covered by full-thickness mesh graft transplants from the upper leg. An individualized orthosis was produced for gait rehabilitation. Two weeks after surgery the gait-related pain was reduced remarkably. 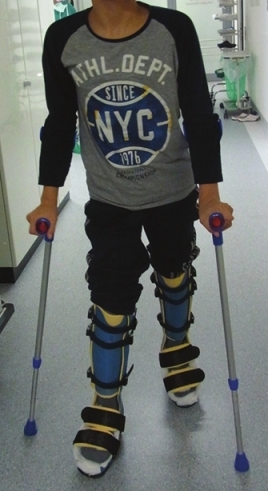 Using the orthosis, the boy was able to walk pain-free even on staircase. Surgery of PCOF with sandwich transplantation and gait rehabilitation appears to be a promising strategy for this rare condition. There are a number of skin diseases that can affect the feet including atopic dermatitis, psoriasis, mycosis, leprosy, blistering disorders, autoimmune connective tissue diseases etc., Hyperkeratotic plaques of soles may be a symptom of acquired (plantar warts, hyperkeratotic irritative contact dermatitis etc.) and inherited skin diseases (keratoderma, ichthyosis, psoriasis etc.). Callosities develop as result of over-reactive keratinisation due to mechanical stress, either pressure and/or shear forces. Corns and calluses/clavi are the major types of callosities. Corns represent well circumscribed area of traumatic hyperkeratosis with a translucent central core which often is painful. Callus or clavus describes a larger, less well defined, often painless hyperkeratotic plaque without a central core. PCOF are characterized by massive compact orthohyperkeratotic plaques located in plantar areas of support disabling normal walking. No associated symptoms of hair, nails, nerves or skin glands have been described. The disease is not inherited and no PCOF families have been described. The pathogenesis of this disease is poorly understood. Accelerated keratinocyte proliferation, decreased desquamation and impaired differentiation a key findings. There is increased expression of certain adhesion molecules like corneodesmosin, desmoglein 1, and desmocollin 1 contributing to decreased desquamation. Callosities are increasing the focal stress in affected soft tissue. Obviously there is a participation of nerves/pain receptors in PCOF but scientific proof is lacking. We report a 14 year-old boy with PCOF treated successfully by surgery. A 14 year-old slim boy presented with a 6 year history of painful massive hyperkeratotic plaques on his soles making pain-free walking impossible [Figure 1]. Painkillers, dermabrasion of hyperkeratotic plaques by diamond mill, topical ointments with salicylic acid and urea, systemic antimycotics, and oral retinoids were all ineffective. Therefore, the family was seeking for help at our department. Family history was unremarkable. We made a detailed clinical examination of the boy. On the toes, forefoot and heels massive plantar, yellowish, malodorous, compact hyperkeratotic plaques were visible. Nails and teeth were normal, hair was short. Mycological cultures were performed from these plaques and from the scalp hair. Trichomycosis was confirmed. To establish diagnosis a deep skin biopsy was performed from the painful plantar region. Histopathological examination disclosed a massive compact orthohyperkatosis without any dermal changes and without inflammatory infiltrates. No fungal elements were seen. Musculature of calves was hypotrophic but joint mobility was not impaired. Peripheral sensory or motor neuropathy was excluded by the neurologist. He had a toe and lateral gait and could only move with bended knees due to the massive pain. Muscular or osseous foot deformities were not found. Pain scores were measured by visual analogue scale with 100 mm for the most severe pain and 0 mm for no pain at all [Table 1]. The combination of painful orthohyperkeratotic plaques of the plantar region associated with extreme pain, absence of associated symptoms and negative family history confirmed the diagnosis of PCOF. Treatment and outcome: We performed a deep excision of the painful callosities in general anaesthesia. Soft tissue defects were closed by sandwich transplantation using a dermal elastin-collagen matrix (MatriDerm® ; Dr. Suwelack Skin and Health Care AG, Billerbeck, Germany) covered by split full thickness skin. Details of this technique have been described elsewhere. In the present case we used the 1 mm thick dermal template dry not reconstituted before grafting [Figure 2]a-c. After graft take a foot-and-lower-leg (knee-ankle foot orthosis-KAFO) moulded orthosis was adjusted for the boy to support normal biomechanics of the feet and ankle during the rehabilitation process. Pain was markedly reduced after surgery [Table 1]. With the orthosis the first walking steps were possible after 2 weeks without the need of painkillers [Figure 3]. There was no malodour of the feet after surgery. Plantar grafts became partially necrotic but wound healing was uneventful after necrectomy. A physical mobilization programme with gait education was started during inpatient treatment and continued thereafter for 4 weeks. In addition trichomycosis was treated by antimycotics and hair re-growth was observed. PCOF are very rare but severely disabling. Pain is preventing any normal biomechanics of feet and ankle making movements almost impossible. PCOF callosities can deprive children of physical activities, childhood experiences, and a healthy life style. There is no topical or systemic drug therapy available for cure. Oral retinoids do not decrease the pain, although they may reduce hyperkeratosis in inherited forms of plantar hyperkeratosis (keratoderma). In the present case, however, they were of out of benefit. The disease affects normal physical development in children and adolescents and impairs psychological well being. After radical excision of the PCOF we also employed a dermal elastin-collagen template in the present case combined with full thickness mesh graft in a sandwich technique. , In contrast to superficial removal of hyperkeratotic horny layer the deep excision of the lesions down to the muscle fascia resulted in a rapid pain relief. In order to improve early rehabilitation in our adolescent boy a specifically tailored KAFO moulded orthosis was employed. It has been demonstrated recently that moulded orthoses produce larger reduction in loading rate and vertical impact force when compared with a control and to a posted non-moulded orthoses. Two weeks after surgery pain was markedly reduced and his gait normalized. He could now walk in an upright carriage. During the next two weeks he was able to climb stairs unaided. There will be a longer time necessary to establish a normal walking without KAFO moulded orthosis but the progress he made in short time raises hopes of a normal life in future for this boy. 1. Shapiro J, Rhee CS. Podiatry screening project for children in the District of Columbia. Public Health Rep 1970;85:803-8. 2. Kim SH, Kim S, Choi HI, Choi YJ, Lee YS, Sohn KC, et al. Callus formation is associated with hyperproliferation and incomplete differentiation of keratinocytes, and increased expression of adhesion molecules. Br J Dermatol 2010;163:495-501. 3. Davys HJ, Turner DE, Helliwell PS, Conaghan PG, Emery P, Woodburn J. Debridement of plantar callosities in rheumatoid arthritis: A randomized controlled controlled trial. Rheumatology (Oxford) 2005;44:207-10. 4. Wollina U. One-stage reconstruction of soft tissue defects with the sandwich technique: Collagen-elastin dermal template and skin grafts. J Cutan Aesthet Surg 2011;4:176-82. 5. Verhoeven EW, Kraaimaat FW, van Weel C, van de Kerkhof PC, Duller P, van der Valk PG, et al. Skin diseases in family medicine: Prevalence and healt care use. Ann Fam Med 2008;6:349-54. 6. Hawke F, Burns J. Understanding the nature and mechanism of foot pain. J Foot Ankle Res 2009;2:1. 7. Bevans JS, Bosson G. A comparison of electrosurgery and sharp debridement in the treatment of chronic neurovascular, neurofibrous and hard corns. A pragmatic randomized controlled trial. Foot (Edinb) 2010;20:12-7. 8. Atlan M, Naouri M, Lorette G, Estève E, Zakine G. [Original treatment of constitutional painful callosities by surgical excision, collagen/elastin matrix (MatriDerm(® )) and split thickness graft secured by negative wound therapy therapy]. Ann Chir Plast Esthet 2011;56:163-9. 9. Wollina U, Meseg A, Weber A. Use of collagen-elastin matrix for hard to treat soft tissue defects. Int Wound J 2011:8:291-6. 10. Mills K, Blanch P, Chapman AR, McPoil TG, Vicenzino B. Foot orthoses andgait: A systematic review and meta-analysisof literature pertaining to potential mechanisms. Br J Sports Med 2010;44:1035-46.